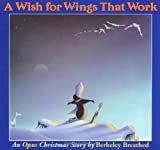 Review of "A Wish for Wings That Work"
This short picture book for young children tells the story of Opus the penguin who wishes he could fly. But being a penguin, his wings dont work. He writes a letter to Santa asking for new wings and posts it with every confidence that he will be flying on Christmas morning. On Christmas Eve, Santas sleigh has an accident and Opus is woken in the middle of the night by a snow duck telling him to come quickly. When Opus sees Santa standing on his sinking sleigh, he swiftly swims to bring Santa to safety. On Christmas morning, Opus is rewarded when hundreds of snow ducks arrive at his front door and lift Opus into the air and grant his wish to experience flying. The story shows that even if there are some things one cannot do, there are other things that one can do, and this is an excellent moral for young children who may be frustrated by their limitations. The color illustrations are particularly sweet, full of small details that will please the observant reader.